Everything You Need To Know About the Jack Russell Terrier on 1 Page. Feisty and energetic, the Jack Russell Terrier can be a bit of a handful for an inexperienced dog owner. This breed is all terrier, absolutely fearless, and naturally confident--the Jack Russell seems to believe that he is a much larger dog than he really is. In the late 19th century an English Parson developed a white terrier to hunt foxes above, and below ground. The Reverend Jack Russell gave his name to the breed, but they are not recognised as such by the British Kennel Club. 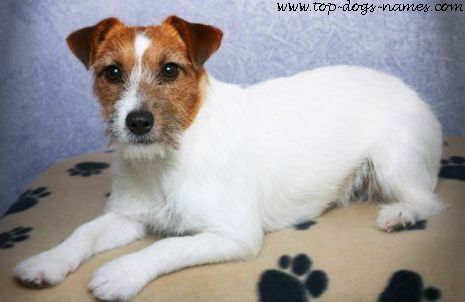 The American Kennel Club however, have classified the Jack Russell as a member of the Terrier Group, but renamed them as Parson's Russell Terriers. The AKC prefers a longer legged dog, whereas British breeders have opted for a shorter legged dog. This breed may be small, but they are very robust. Built to be flexible and compact so they could easily go to ground in search of their prey. Their dark, almond shaped eyes sparkle with alertness. And like most terriers, this is a busy dog, their docked tail is rarely still, always wagging it enthusiastically about who knows what! These dogs weigh around 13 to 17 pounds and stand 10 to 15 inches high. The Jack Russells coat comes in three varities wire haired, rough and short. More than half of their coat coloring is usually white. The remainder is a mixture of tan, brown and black markings. Jack Russell Terriers need very little grooming. Just run a good quality bristle brush through the coat once or twice a week to remove the dirt. will go under, over, and around any obstacle to escape when they are bored, or in exploration mode. So burning up this energy through a brisk daily run is vital. This breed enjoy attention, and are always ready for any form of play. If you have children, this dog is guaranteed to keep them entertained, provided they have been taught not to tease him. Family life definetly suits these dogs, the more active the better. The Jack Russell Terrier is a spirited breed. Don't neglect obedience training just because of his small size. Without adopting a good dog training method these dogs tend to be willful, and often aggressive towards other dogs. Puppy training classes will help you to socialize your puppy, so that he learns at an early age to play with other dogs, rather than squabble with them. Jack Russells can develop eye and ear problems, sometimes leading to deafness. But, in general, this is a healthy breed. The Jack Russell Terrier can be a loyal and devoted family pet. But, you need to understand the characteristics of terriers, and this variety in particular. As long as your willing to do this--your Jack Russell will reward you many times over. Check out these Jack Russell Terrier Names. For the United Kingdom: The Kennel Club. For Canada: The Canadian Kennel Club. Dog Breed Start Page. Golden Retriever Labrador Retriever. Basset Hound. Boston Terrier. Bulldog. Yorkshire Terrier. Collie. Jack Russell Terrier. Dalmatian. Doberman.